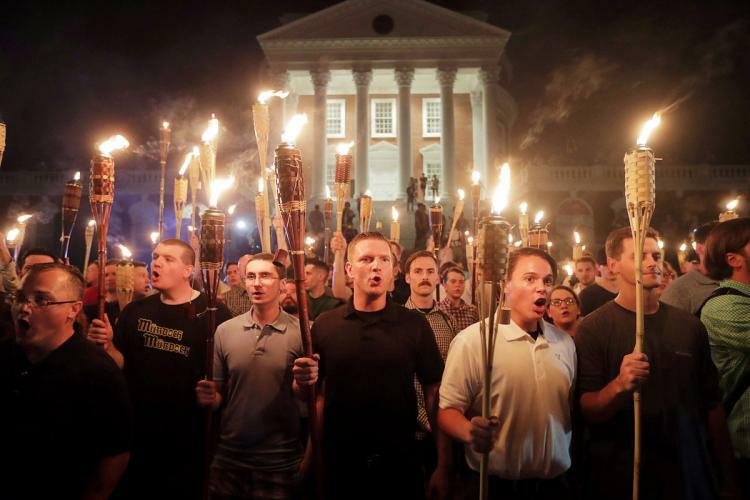 White supremacists gather in Charlottesville, Virginia. Our country is a warzone. Places like Charlottesville, Virginia are simply the battlegrounds in a fight between what many refer to as “white nationalists” and those seeking equality and peace. Those under the sugarcoated label of “white nationalists” are simply a hodgepodge of white supremacists, KKK members and neo-nazis. “You had a group on one side that was bad, and you had a group on the other side that was also very violent,” Trump stated. This is the exact response the tiki torch-wielding white supremacists were looking for. This statement does not denounce their actions nor does it attempt to put out the fire; it only adds fuel. Trump has been in office for only 208 days and his approval rating has slumped to 35 percent. If you do not believe that our President is tearing this country apart, think again. We live in a divided country. I do not ask to reshape the political system by taking away parties but I do ask President Trump to unite our nation under one flag, not the Confederate flag which stands for so much hate and oppression rooted in our disgusting past, but the American flag, a flag that represents all 50 states, all people living in this country no matter their race, religion, gender or sexual orientation. We, the American people, need to come together in times of hate and uncertainty. I ask you not to accuse blindly or act out irrationally but instead, educate yourself on matters affecting our country and step forward to make a change. Do not fight against the “Unite the Right” movement but instead, unite for what is right. As I sit and watch swastikas, confederate flags and white hoods displayed on national news outlets, I wonder if this is the America Trump imagined when he first said “make America great again.” Well, if this was the goal, we might as well rename the country…welcome to AmeriKKKa. 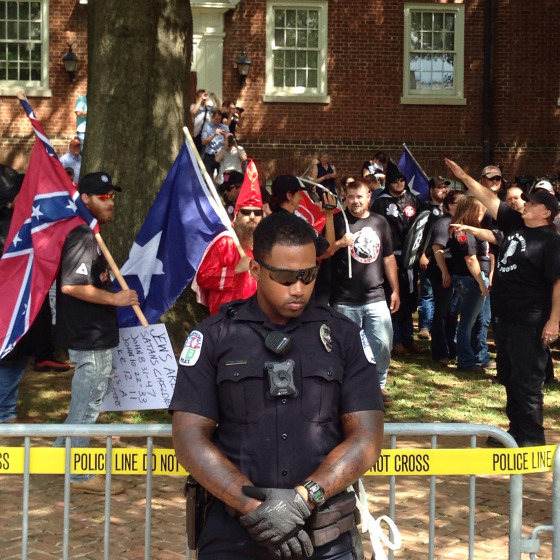 An officer stationed in front of a KKK rally in Charlottesville, Virginia.